Sunday, June 2, 2019 is the date for the 5th annual Lakeshore Invitational Tournament. This year's tournament will be co-hosted by the Branch Blaze and Manitowoc Bandits. The tournament will once again feature six teams in pool play. The 3rd Lakeshore Invitational Tournament took place on Sunday, June 4, 2017 in Manitowoc and Branch. The field consisted of the co-host Branch Blaze and Manitowoc Heat as well as the Two Rivers Polar Bears, Plymouth Flames, De Pere Dodgers, and Kewaskum A's. Two Rivers and De Pere won their respective pools and faced off in the Championship game with De Pere coming away with the win. Dodger's player Connor Rutherford was named tournament MVP by going 4 for 13 at the plate with a double, a homerun, and 5 RBI's. 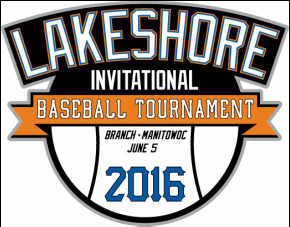 The 2016 Lakeshore Invitational Baseball Tournament was held on Sunday, June 5. This year's participants were the co-hosts Branch Blaze and Manitowoc Heat and the De Pere Dodgers, Little Chute Bandits, Plymouth Flames, and Two Rivers Polar Bears. The championship game featured pool winners De Pere and Little Chute. However, the game was called after a half inning of play due to rain and both teams were declared co-champions. 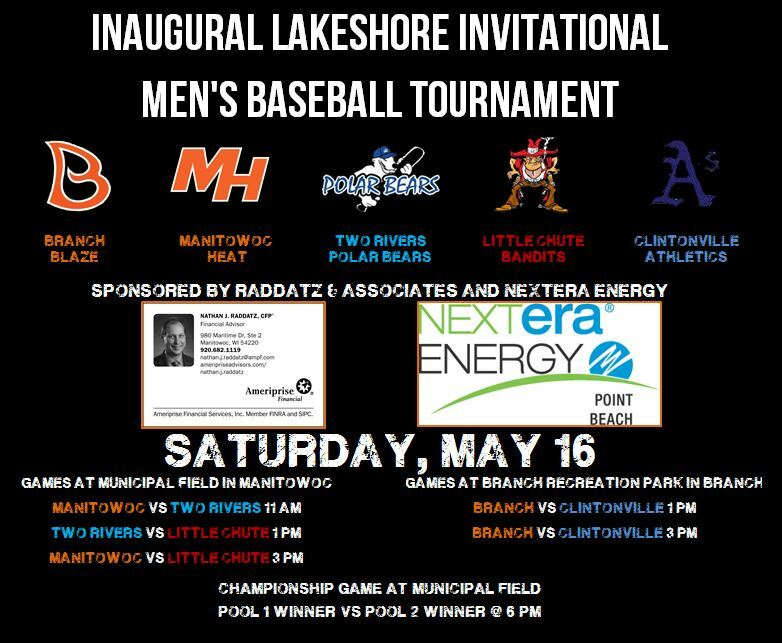 The inaugural Lakeshore Invitational Baseball Tournament took place on Saturday, May 16, 2015. The competing teams were the co-hosts Branch Blaze and Manitowoc Heat as well as the Clintonville Athletics, Little Chute Bandits, and Two Rivers Polar Bears. The Branch pool was won by Clintonville with a 2-0 record. Two Rivers won the Manitowoc pool with a 2-0. Two Rivers defeated Clintonville in the championship game. Parker Mindell of Clintonville was named Tournament MVP.